On July 13, the first group of students to participate in the Foundation’s new educational programs was welcomed to the DeVos Learning Center at the Gerald R. Ford Presidential Museum. A summer learning group from Vocal Music Workshop brought 18 middle school students from Grand Rapids Public Schools to learn, explore, and be inspired. The program focused on what it means to be an engaged citizen, regardless of your age. 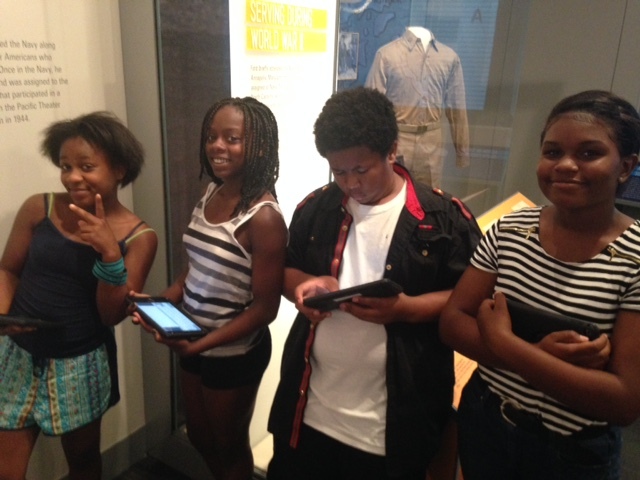 Students used i-pads to explore the new Museum exhibits and create their own e-books that showcased examples of the ways President Ford engaged in his community and displayed good citizenship. By taking photos and writing their own text, the middle-schoolers were able to collect the information they learned and share it with their teachers and classmates in a very interactive way.